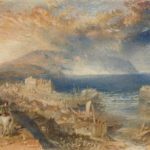 The contrasting approaches of two great masters of English landscape painting, Turner and Constable, are showcased in a new exhibition at the Clark. Joseph Mallord William Turner, Wolf’s Hope, Eyemouth, circa 1835, watercolor and gouache over graphite, with scraping, on cream wove paper, 4.13 x 6.5 in. 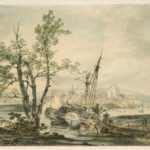 Joseph Mallord William Turner, Rochester, circa 1793, watercolor with pen and gray ink on cream wove paper. John Constable, Willy Lott’s House, circa 1812-13, oil on canvas, 13.75 x 17.13 in. Joseph Mallord William Turner, Saumur from the Île d’Offart, with the Pont Cessart and the Château in the Distance, circa 1830, watercolor and gouache with pen and black and brown ink over traces of graphite on blue wove paper, 5 x 7.56 in. 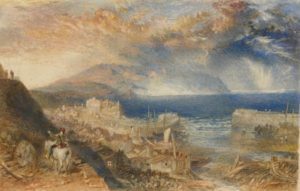 In an early watercolor, the celebrated English landscape painter Joseph Mallord William Turner (often referred to as J. M. W. Turner) portrayed a view of Rochester, a city in Kent. 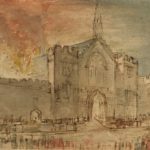 The city is known now, as it was in Turner’s time, for its eponymous cathedral and castle—the former housing the second-oldest diocese in England and the latter sporting one of the best-preserved keeps, or fortified towers, in England or France. Yet in the circa-1793 work, Rochester, the famous cathedral and castle fade, quite literally, into the background. Turner’s view fronts a row of cargo ships and workers carrying lumber on their shoulders, while the urban center and its medieval masterpieces glint behind them on the horizon. Here, Turner favors the kinetic energy of the contemporary over the majestic inertia of the antique, the now over the then. Turner, known as a painter of breathtaking views and extraordinary weather, also had a knack for representing daily life. Not entirely unlike the seas and storms that course with violent energy through such masterpieces as Clair Pier (1803) or The Wreck of a Transport Ship (circa 1810), his calmer vistas are often punctuated by figures or buildings that look busy and lived in. These additions help create the sense that Turner’s scenes are in the midst of happening, even though many of his views and subjects were in fact amalgamations of places and people he saw throughout his extensive travels or read about in literature. 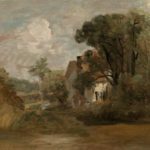 The significance of human figures and built environments in the paintings of both artists takes center stage in “Turner and Constable: The Inhabited Landscape,” a new exhibition that goes on view at the Clark Art Institute in Williamstown, Mass., on December 15. The exhibition makes use of the 200 oil paintings, sketches, works on paper, and prints in the Clark’s Manton Collection of British Art. Amassed by the collector Sir Edwin Manton and gifted to the museum by the Manton Art Foundation in 2007, the collection explores 19th-century British art in depth. “We wanted to show the richness of the gift, especially in works by Turner and Constable, and we also wanted to interpret the collection anew,” says Alexis Goodin, curator of the show. The exhibition was also an opportunity to showcase how the pieces from the gift fit in with those collected by the institution’s namesakes, Sterling and Francine Clark. Constable had cultivated this practice even before he was formally trained as a painter. As a youth, he embarked on sketching trips in the Suffolk and Essex countryside. “The sound of water escaping from mill dams…willows, old rotten planks, slimy posts, and brickwork, I love such things,” he wrote. Even during his time at the Royal Academy, he would return from London during the summers to paint, sketch, and, as Goodin puts it, “store up ideas for the winter”. Though Suffolk remained his favorite subject, Constable did travel around England and paint or sketch other places. The exhibition features Salisbury Cathedral from the West (July 23, 1829, graphite on cream wove paper), a lively sketch with a figure fishing in the foreground and the gothic Salisbury Cathedral standing regally in the background, its spire projecting skyward. Constable’s friend the Bishop John Fisher lived in Salisbury, and the town became a frequent subject of the artist’s. The cathedral in particular served as an ongoing inspiration, becoming the subject of Salisbury Cathedral from the Bishop’s Grounds (circa 1828, oil on canvas), a gift to Fisher that is now in the Frick Collection, as well as several drawings from varying perspectives in the Clark’s collection. In Yarmouth Jetty (circa 1822–23, oil on canvas), a view of the water at the seaside town in Norfolk, a luminous sky takes center stage, but Constable’s propensity for using figures as scenery is evident with a small red-capped boy on the beach with a cart and a horse. Osmington Village (1816–17, oil on canvas), a loan from the Yale Center for British Art, depicts the rolling hills of the quaint Dorset village where Constable and his wife spent their honeymoon. Leading with a view down a dirt lane, figures sparsely dot the landscape, suggesting whom one might meet along the way. One that toes the line of being “place-able” is Rockets and Blue Lights (Close at Hand) to Warn Steamboats of Shoal Water, an 1840 oil on canvas and another highlight of the show. During this later era of his career, Turner spent a lot of time at Margate in Kent. There, he studied and painted the coast as it was affected by different weather patterns and different times of day. This resulted in the creation of dozens of oils and watercolors. The present example is a vortex of color devolving almost entirely into abstraction. In the seascape, abstracted though it is, one can still make out a group of darkened figures on the beach at the bottom left. In Saumur from the Île d’Offart, with the Pont Cessart and the Château in the Distance (circa 1830, watercolor and gouache with pen and black and brown ink over traces of graphite on blue wove paper), Turner, as in Constable’s The Wheat Field, portrays several types of workers working simultaneously. 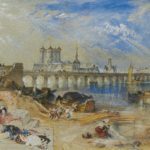 Here Saumur, a town on the Loire River in west-central France, bustles with activity, as washerwomen lay laundry out to dry in the sun and men load cargo onto barges. The painting also showcases Turner’s aptitude for imbuing architecture with character. 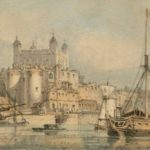 The Tower of London (circa 1794, watercolor over graphite on cream wove paper), an early work that served as a preliminary watercolor for an engraving that appeared in The Pocket Magazine on January 1, 1795, is another example. In this depiction of the infamous prison from across the ship-dotted Thames, the tower seems to gleam proudly at the viewer. Turner’s portrayals of architecture would become much more mirage-like toward the end of his career. In the 1854 watercolor Brunnen from the Lake of Lucerne, Turner blasts the canvas with rosy light, so that the buildings at the edge of the lake and the mountains behind it become obscured, seemingly fading before one’s eyes. Meanwhile, the figures in the foreground, standing on and rowing small boats, go about their work.